After some component shopping and leaving the current prototype to produce some serious test output, my hardware random number generator project takes several unexpected turns. 00:00:45 What case to use for the device? Ross Anderson, Security Engineering with both first and second edition available online. 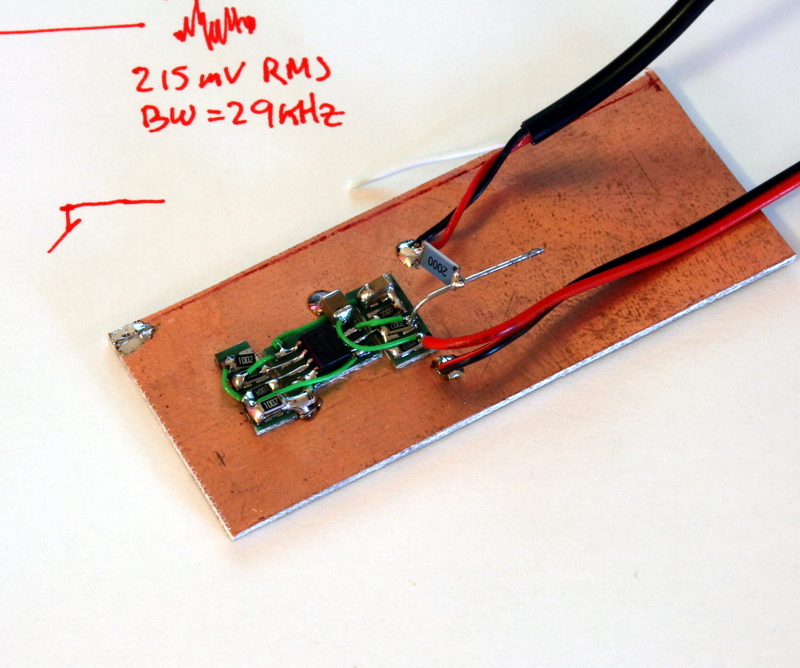 Here is a much simpler version of a thermal noise source. It uses one (dual) opamp, 7 resistors, 3 capcacitors, and outputs 200mV RMS 30kHz bandwidth noise. 200mV is about as much as it is possible to get out of the single package. There is plenty of gain left in the opamp, but the total gain must be set comfortably lower than the crosstalk to prevent oscillation. The 800Hz high pass is intentional, it rejects hum. And the circuit requires shielding, otherwise it is a finger proximity detector. that looks pretty cool! But of course, I immediately have a question (or three): The capacitors according to your diagram are 1uF/1uF/22uF from left to right; what do you use there? With those capacitances I’d expect electrolytic caps, but all I see on your photo are three ceramics, two of them apparently stacked on top of each other. Did you mean nF instead of uF? Anyway, a lot of crazy things have happened lately with and around my stuff. If things work out I’ll record another episode tonight, primarily on the concept of entropy but also with an update on what happened since the last video. To the very left, under the 10K, is the 1uF 16V X7R (CC1206KKX7R7BB105) on the center voltage. At the very right, on the bottom, is a 2.2nF capacitor I erroneously picked out of the bag, thinking it was 1uF. Rather than remove it, I slapped 1uF on top of it. And the big 1210-sized 22uF 16V X5R is very much a ceramic (GRM32ER61C226KE20L). When picking ceramic capacitors, pay attention to the dielectric (here X7R and X5R). Some of the dielectrics (such as Y5V) offer wild capacitances in small packages, but are so voltage dependant that they lose 80% of their capacitance at rated voltage, are dangerously microphonic, and so forth. Here’s a fun thing: As built, the bandwidth limit is on the first stage. So halving the noisy resistor, while it reduces the noise/Hz to 0,7, also should double the bandwith, producing the same RMS output. From the discussions throughout this week’s Cryptech meeting in Stockholm I’ve learned a few things which showed me that picking the right technology for a cryptographically sound HWRNG is even worse than I thought. I’ll try your circuit as soon as I get hold of a TLC072 (next time I mail order components, it’ll be on the list); with the shielding issue is something I’m a bit uncomfortable about in this sort of context, but then again, with all the dead ends I’ve run into so far any new option to have as an alternative solution is really welcome news to me. I have to add one pro Kasper’s design. Using lower voltages allows for greater bandwidth. When I saw your first video in which you’ve bee using 6V+ Zener – it was the very first thing that crossed my mind – Go lover voltage. On top of that if you start using lover voltage your signal edges become much steeper and that’s what allows faster signal generation. Any how, I just stumbled up on your blog yesterday. I am very interested in what you are doing. Actually I have fev similar projects in the pipeline. I would like to keep in touch and exchange observations. From what I’ve seen so far – Great work! sorry for the delay, but aside from generally being painfully busy the last few weeks, I spent the entire week at the RIPE meeting in London. 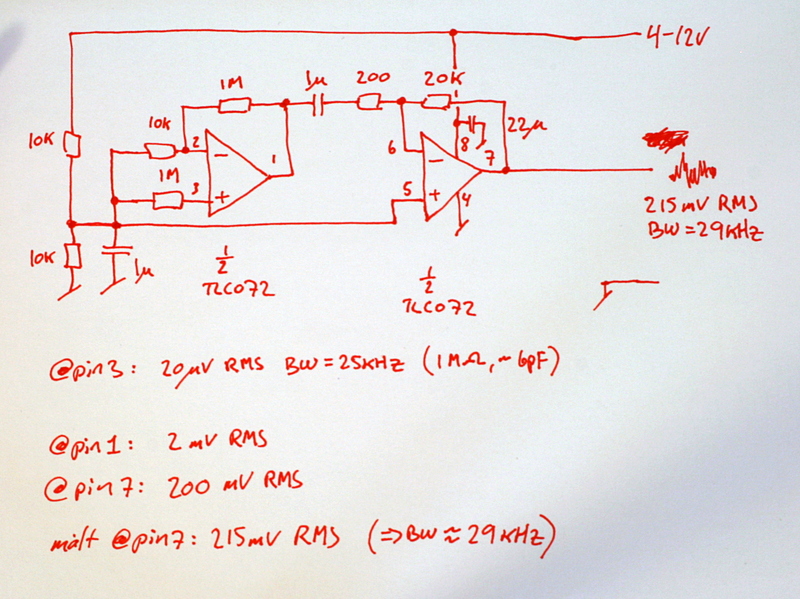 Anyway, it’s not quite as easy as it seems: If I lower the breakdown voltage of the “Zener” diodes I use below 6.8V, then the signal quickly gets much weaker. The bandwidth should increase at that case because the Zener effect (single electrons tunneling through the junction) will take over from the avalanche effect (bursts of electrons breaking through) but using true Zener noise requires much more amplification, which in turn makes the entire design much more susceptible to external manipulation. If I went *up* with the breakdown voltage, then the frequency spectrum would also shift some, but at the same time the power consumption would also increase, the latter approximately at the square of the voltage. Since USB only provides 100mV without previous negotiation with the host, and me actually believing that specs are there to adhere to, the result is that I do use the 6.8V. Similar considerations applied to the external voltage used to drive the “Zener” diodes, so what happened that I first got that circuit running somehow using two transistors for amplification, and then tuning various parameters until I got the fastest output I could get at the least possible power consumption.